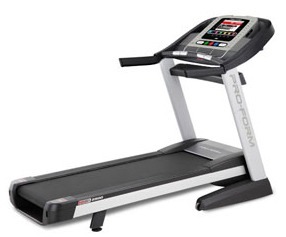 The ProForm Pro 4500 treadmill is the most advanced model for runners that ProForm makes. They have packaged a large and powerful motor with a spacious deck, added all the best features, and then went all-out by installing an integrated internet browser screen right on the console. The 10" full color touch screen display with a Web Browser Powered by Android™ lets you connect to the internet via wireless home network to download iFit Live features, as well as surf the web, check email, and more. UPDATE: The ProForm Pro 4500 has been discontinued and replaced with the all new upgraded PRO Series models. To find a comparable treadmill check out the new full lineup from ProForm to see which model appeals to you. The ProForm Pro 4500 treadmill goes big in all the areas a runner wants: a 20" x 60" 2-ply commercial-grade tread belt, full surface suspension, 1-Touch™ incline buttons that let you change the incline/decline with one touch rather than scrolling through different levels, and the fold up design with a hydraulic lift assist. The motor is the core of the 3.8 CHP drive system, which uses high-end components, commercial bearings and brushes, and is backed by a lifetime warranty. This is a quiet motor that powers ProForm’s largest and most durable tread belt that can handle a user weight capacity of up to 450 pounds. Other features of the ProForm Pro 4500 treadmill include a large fan, iPod music port and speakers, handgrip and wireless heart rate monitoring, and a variety of workout apps. The Pro 4500 has a generous 5-year parts warranty with 2 years of in-home service coverage. The iFit Live feature ($129 if purchased separately) interacts with downloadable programs and workouts designed by Jillian Michaels and Elisabeth Hasselbeck. Other features are Workouts Powered by Google Maps™, World Tour Workouts featuring famous trails and routes, Event Training such as a 5K run as well as a full marathon, and more. One note: ProForm has been very attentive to user feedback and reviews, and has improved its customer service in the past two years, although there are still some issues. On the plus side, since the treadmills themselves have been greatly improved, hopefully you won’t need to contact customer service (and wait on hold for an hour) to resolve a problem. 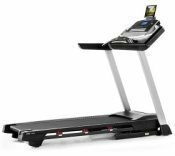 ProForm has typically built treadmills for the low-end to mid-priced range (about $599 to $1499 range), so it remains to be seen if they will be as successful with this model matched up against high-end models from leading brands such as True, Lifespan, and Precor. The other Pro Series model, the ProForm Pro 2500, is a better value: it has the same specs as the Pro 4500 and it also has a -3% decline feature (the 4500 does not!) 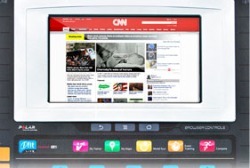 and a one-touch screen. The Pro 2500 doesn’t have the dashboard Web Browser like the 4500 does, but do you really need it? You can buy a tablet computer like an iPad for around $500 and you can take it anywhere you go – it won’t be stuck at home on your treadmill. The ProForm Pro 4500 treadmill is a nice treadmill but we would save the $500 difference and go with the Pro 2500.